New York, NY, March 08, 2019 --(PR.com)-- The research papers titled, “Optimism, positive affectivity, and salivary cortisol,” “Humor attenuates the cortisol awakening response in healthy older men” and “Loneliness and Diurnal Salivary Cortisol in Emerging Adults” are written by Julian Chuk Ling Lai. Findings reported in the three papers demonstrate a close association between positive psychological factors and cortisol, and thus provide an explanation of how positive psychological conditions are translated into better health and well-being. In the first work, “Optimism, positive affectivity, and salivary cortisol,” Dr. Lai’s objective was to examine the impact of optimism and positive effect on salivary cortisol with the effects of their negative counterparts controlled for. In recent times, the detrimental role that psychosocial stress plays on the physical and mental health of various individuals is being recognized. Cortisol is also known as the “stress hormone.” This, however, is partially supported by the scientific data which broadly links cortisol dysfunction to both stress and ill-health. According to Dr. Lai, despite some of the findings related to this subject, there has been no attempt to look systematically at the association between cortisol and resilience related factors such as optimism, positive affectivity, or self-esteem, which are most closely related to the construct of positive well-being. Dr. Lai’s findings are significant because they point to the importance of optimism and generalized positive effect in influencing different components of the diurnal cortisol cycle when the effect of negative psychosocial dispositions and mood states were statistically controlled. For instance, it was shown that higher optimism was associated with a lower level of cortisol in the post-awakening period. In addition, a lower cortisol concentration was observed in participants who reported higher positive affect. In other words, the presence of the positive factors could be more important than the absence of negative factors in promoting health and well-being. In the paper, “Humor attenuates the cortisol awakening response in healthy older men,” Dr. Lai attempts to examine the impact of an important factor contributing to successful ageing, humor, on post-awakening cortisol levels among a group of 45 older men with an average age of 73.6 years. According to Dr. Lai, the proliferation of research on stress and ageing in humans in the last few decades was driven primarily by the hypothesis that the capacity to adapt to stressful forces in life declines with age is marked by a progressive dysregulation of the hypothalamic-pituitary-adrenal (HPA) axis. However, attempts to verify this hypothesis have not generated equivocal findings. This points to the possibility that prior research was confounded by individual differences in that some seniors may age more successfully and thus are less likely to exhibit the predicted decline. This motivated Dr. Lai and the team to design their study to examine the impact of the construct of humor on cortisol awakening response (CAR) on the basis of some considerations mentioned in detail in the research work. On deeper analysis and research, the conclusion of this study showed that humor, when operationalized as a coping mechanism, was associated with an attenuation of the overall level of cortisol in the awakening period in older men. In the study, “Loneliness and Diurnal Salivary Cortisol in Emerging Adults,” Dr. Lai and the team aimed to examine the relationship between trait loneliness and diurnal rhythms of salivary cortisol. Loneliness (or perceived social isolation) has emerged as an important determinant of the physiological processes of stress and increased morbidity in recent research. However, the integration of findings regarding the association between trait loneliness and cortisol has been challenging. Hence, Dr. Lai and his team designed this study to re-examine the relationship between loneliness and salivary cortisol in Chinese young adults, with saliva sampling times monitored objectively using electronic devices. It has also been seen that the assessment of cortisol levels or diurnal rhythms poses a major challenge due to the daily rhythm of cortisol. Dr. Lai’s findings suggest that higher loneliness scores were associated with increased cortisol secretion and an attenuated CAR in emerging adults. Furthermore, it was seen that lonely participants also exhibited a steeper decline of cortisol over the day. However, Dr. Lai has also pointed out that the findings may not have addressed a number of issues because cortisol levels were based on saliva samples collected on one single day from a relatively small sample of 51 participants. Hence, more research is needed in this subject to understand the role that cortisol plays in this process. In sum, the work of Dr. Lai and his associates has illustrated that maintaining a positive psychological profile such as being optimistic, humorous, and socially connected contributes to a cortisol profile associated with better health. This provides a physiological explanation of the well-documented associations between positive psychological constructs and better health in the literature. Dr. Lai has recently extended his research on cortisol into biological aging to explore the question of whether seniors with a healthier cortisol profile will be biological younger. Studies looking at the relationships between social embeddedness, cortisol and telomere length in the elderly will be underway soon. Dr. Lai’s research papers have exemplified his scientific understanding and his in-depth research skills. His work has set a precedent for the younger generation to carry forward his work and discover more insightful findings. Dr. Chuk-ling Julian Lai obtained his Bachelor's degree in psychology from the University of Toronto. He joined the City University of Hong Kong to start his research career after graduating from the University of Hong Kong with a PhD in psychoneuroimmunology. In addition to research on the psychophysiology of stress, he also engaged in research on topics associated with personality and social psychology, health psychology, and environmental psychology. One of Dr Lai's major contributions is the adoption of salivary cortisol as a biomarker to examine the health impact of personal and interpersonal characteristics in Chinese populations. He is also one of the few scholars who pioneered research on the psychosocial determinants of pro-environmental behaviour in the Chinese people. His recent research highlights the importance of social integration and positive psychological attributes in determining health and wellbeing in the Chinese people. Dr Lai’s major publications appear primarily in prestigious journals such as Biological Psychology, Psychoneuroendocrinology, Personality and Individual Differences, and Journal of Environmental Psychology. He has been actively transferring his expertise in academic research by serving as an expert reviewer for a number of well-established journals in psychology and major research funding bodies. He was the Editor of the official journal of the Hong Kong Psychological Society (2009-2012) and Cogent Psychology (2017-2018). 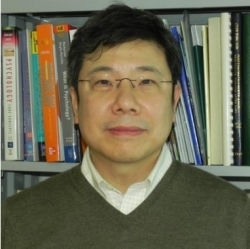 He is a former president of the Hong Kong Psychological Society (2004-2005), and a former honorary research fellow of the Center on Behavioral Health of the University of Hong Kong.